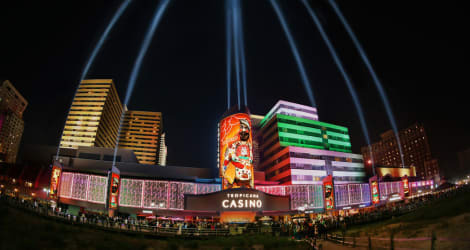 Located in Atlantic City, Harrah's Resort Atlantic City is a 1-minute drive from Harrah's Atlantic City Casino and 7 minutes from Boardwalk Hall. This 4-star resort is 2 mi (3.3 km) from Absecon Lighthouse and 2.1 mi (3.4 km) from Atlantic City Historical Museum. Enjoy American cuisine at The Twenties Restaurant, a restaurant which features a bar and an ocean view. You can also stay in and take advantage of the room service (during limited hours). Relax with a refreshing drink from the poolside bar or one of the 3 bars/lounges. Cooked-to-order breakfasts are available daily for a fee. Located in Atlantic City, Showboat Hotel is a 4-minute drive from Steel Pier and 8 minutes from Boardwalk Hall. This beach hotel is 1.5 mi (2.5 km) from Atlantic City Convention Center and 5 mi (8.1 km) from Brigantine Beach. 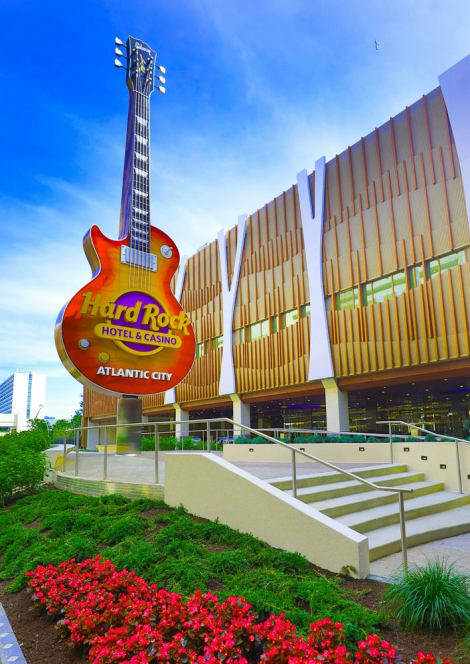 With a stay at Hard Rock Hotel & Casino Atlantic City, you'll be centrally located in Atlantic City, a 10-minute walk from Atlantic City Beach and 10 minutes by foot from Atlantic City Boardwalk. This 4-star resort is 0.5 mi (0.7 km) from Steel Pier and 1.2 mi (1.9 km) from Tanger Outlets The Walk. Enjoy a satisfying meal at Country Kitchen serving guests of Days Inn by Wyndham Atlantic City Oceanfront-Boardwalk. Continental breakfasts are available daily for a fee. With a stay at Borgata Hotel Casino & Spa, you'll be centrally located in Atlantic City, a 5-minute drive from Harrah's Atlantic City Casino and 7 minutes from Boardwalk Hall. This 4.5-star resort is 1.9 mi (3 km) from Atlantic City Convention Center and 2 mi (3.3 km) from Atlantic City Beach. 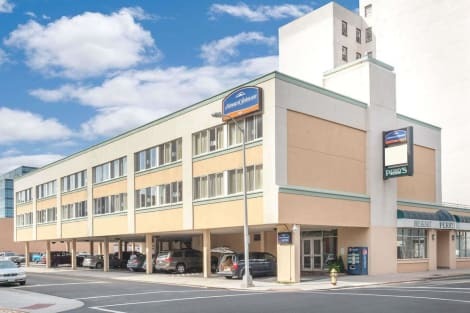 Within 3 Miles of the World renown Atlantic City Boardwalk and Casinos, Convention Center and Marina.High Speed Internet and Free Continental Breakfast. Sorry, no Pets. casino Shuttle - only on Weekends, Friday and Saturday. Enjoy a meal at Perrys Cafe or snacks in the coffee shop/café. The hotel also offers room service (during limited hours). Full breakfasts are available daily from 7 AM to 1 PM for a fee. Be sure to enjoy recreational amenities including an indoor pool and a fitness center. Additional amenities at this condominium resort include complimentary wireless Internet access, concierge services, and an arcade/game room. Make yourself at home in one of the 2379 air-conditioned guestrooms. Cable programming and video-game consoles are provided for your entertainment, while complimentary wireless Internet access keeps you connected. Private bathrooms have complimentary toiletries and hair dryers. Conveniences include irons/ironing boards and blackout drapes/curtains, as well as phones with free local calls. 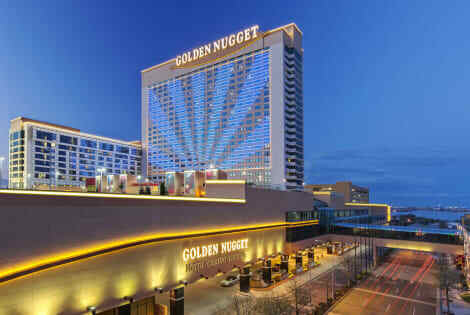 With a stay at Golden Nugget in Atlantic City, you'll be within a 5-minute drive of Harrah's Atlantic City Casino and Harrah's Pool. This 4-star resort is 1.6 mi (2.6 km) from Atlantic City Beach and 1.8 mi (2.9 km) from Atlantic City Convention Center. lastminute.com has a fantastic range of hotels in Atlantic City, with everything from cheap hotels to luxurious five star accommodation available. We like to live up to our last minute name so remember you can book any one of our excellent Atlantic City hotels up until midnight and stay the same night.